Social Security Death Index (SSDI) search is not necessarily as straight forward as you might think. 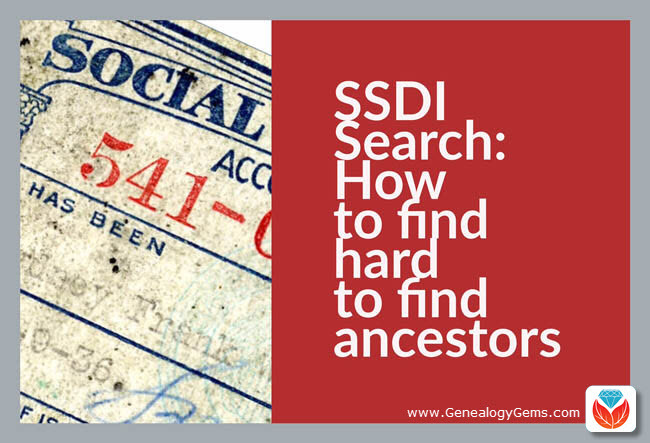 We’re going to explore what SSDI records are, their range of availability, and how they compare across the Genealogy Giants records websites. Thank you so much for all your helpful resources on your website!! I just listened to the SSDI Working Backwards podcast episode (Family History: Genealogy Made Easy episode 3) and my grandparents passed away in 2012 and 2014. Do you know when the last time the index has been updated, I cannot locate them. This two-fold question is a good one. While many genealogical record sets have privacy laws that dramatically restrict more recent records from being available, the SSDI is not one of them. But even if the records are available, there may still be times when we have trouble locating our relatives. Whenever you run into a road block finding ancestors in a record collection, do what good detectives do, and go back to the beginning. In this case, let’s learn more about the collection itself. The Social Security Act was signed into law in 1935 by President Franklin Roosevelt. By 1937, more than 30 million Americans had registered. Today, the Death Master File from the Social Security Administration contains around 90 million records of deaths and they are publicly available online. Some data goes as far back as 1937, but most of the information included in the SSDI dates from 1962. This is because the Social Security Administration began to use a computer database for processing requests for benefits in 1962. Some of the earlier records back to 1937 have not been added. It’s important to know that the SSDI does not have a death record for everyone. It’s also very possible that you may occasionally find an error here and there if something was reported incorrectly. But don’t let that stop you from tapping into this major resource! It’s a wonderful alternative source for finding people who were counted in the 1890 census (which was unfortunately mostly destroyed) because they may still appear in the SSDI. Also, those who were born before vital records registration in their home state began, may also show up. Remember, working folks just had to live past 1937 to have been possibly included. That means some people could have been born sometime in the late 1800s. Now that we have a handle on the history of the SSDI, let’s look at who has it and how recent their records are. The Social Security Death Index (SSDI) is available on all of the ‘big 4’ genealogy records websites, which we here at Genealogy Gems refer to as the “Genealogy Giants.” The links below will take you directly to the SSDI search page for each. In Marti’s case, she will want to search every single one of these websites for her ancestors. The good news is that they all appear to be up-to-date, but that doesn’t mean they are all exactly the same. The same collection of genealogy records can appear differently from site to site for a number of reasons such as accidental omissions, variations in the power of their search engine, differences between indexers and scanners, and Optical Character Recognition (OCR) inaccuracies. These may or may not affect the SSDI, but the point is that you can’t go wrong searching each one of the Genealogy Giants just in case. And since SSDI search can be conducted for free at all of the Genealogy Giants, it doesn’t cost you anything to do so. A quick way to find all of the websites that include the SSDI is to Google SSDI genealogy. Here’s a link to the results. Another excellent reason to search the SSDI on multiple websites is that each website displays the information a little differently. 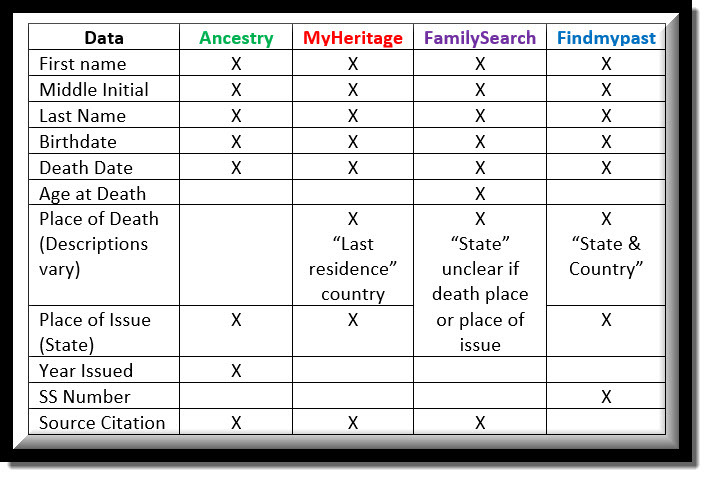 And as you can see from the chart below, when it comes to the Genealogy Giants, there are definitely differences. It’s interesting to note that Ancestry is the only website that provides information about the year that the Social Security number was issued. 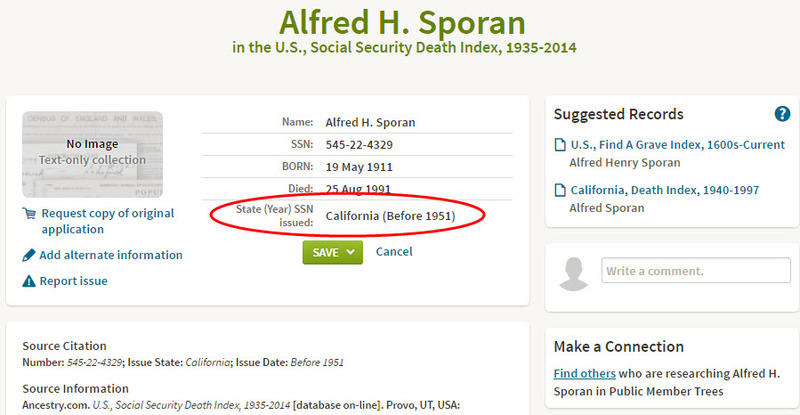 It isn’t exact, but it’s more than the others offered in my search for Alfred H. Sporan. The differences between the 4 major websites can be sometimes subtle or quite dramatic. Understanding their strengths and weaknesses, as well as free versus subscription offerings, is key to successful research that is both efficient and cost effective. The quick reference guide Genealogy Giants: Comparing the 4 Major Websites is a must-have for anyone serious about getting the most out of free and paid subscriptions. 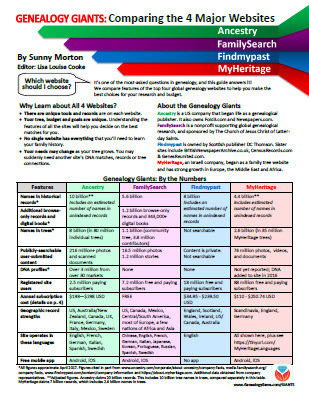 The author of this 4-page full color cheat sheet, Sunny Morton, is Contributing Editor here at Genealogy Gems, and she’s packed this guide with everything you would ever want to know, and many things you probably didn’t know that you needed to know. You can pick up your copy here in our store. There is another database at Ancestry that is worth keeping your eye on. It’s called the U.S. Social Security Applications and Claims Index and it shouldn’t be missed! Currently this covers 1936-2007, but who knows, they may update it in the future. It includes even more information. It was first released in 2015. Read more about it here at Genealogy Gems. Gems: Share Your SSDI Search Experience! I invite you to take a moment to share your SSDI search experience in the comments below. Did you find a difference between the records found at different websites? We want to hear your story, because we all benefit from each other’s experiences. This is an excellent article explaining the SSDI. Thank You! !